Check out all of our video content in our La Bohème video library. 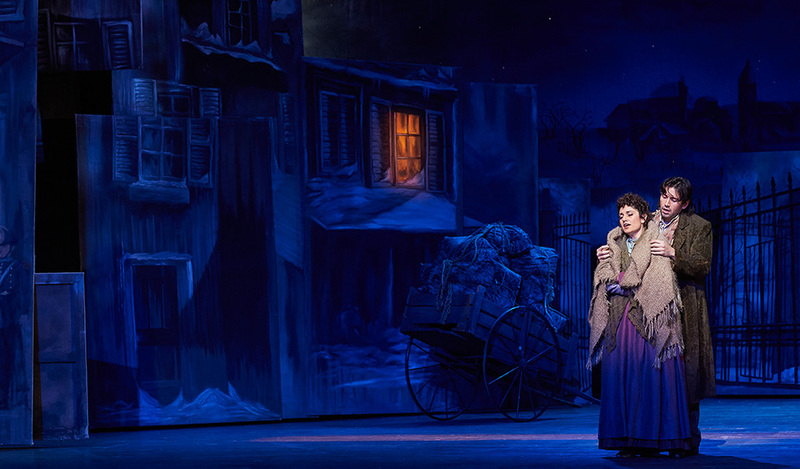 Performance alert: La Bohème contains live flame and atmospheric effects. Should you have questions or require more details, we invite you to contact our team at 416-363-8231 or 1-800-250-4653. Performance time is approximately two hours and 10 minutes, including one intermission. ACTS I & II: 53 minutes / Intermission 25 minutes / ACTS III & IV: 52 minutes. Set against the exhilaration and poverty of 19th-century bohemian Paris, poet Rodolfo falls in love with the fragile Mimì, while his painter friend Marcello reunites with his former flame Musetta. Jealousy plagues both couples and they break up. Mimì, deathly ill with tuberculosis, returns to Rodolfo, only to die in his arms. It is Christmas Eve in Paris. Two poverty-stricken young artists, Marcello, a painter, and Rodolfo, a poet, attempt to work in their freezing garret; in desperation they burn one of Rodolfo’s dramas to keep warm. Their two roommates, Colline, a philosopher, and Schaunard, a musician, return home. Even though Schaunard has brought food, the four bohemians decide to eat their Christmas dinner in the Latin Quarter. Just then, Benoît, their landlord, arrives to demand his overdue rent. The men ply him with drink and, when he boasts of marital indiscretions, they feign moral indignation and throw him out. Marcello, Colline, and Schaunard leave for the Latin Quarter. Rodolfo, always the loner, promises to join them after finishing some work, but a knock on the door interrupts him. Mimì, a young neighbour, enters in search of a light for her candle. Clearly ill, and breathless from the stairs, she faints and drops her room key. Rodolfo is entranced by her and, when she recovers, manages to detain her by concealing the key. Either by accident or design, both their candles go out, and as they search in the darkness for the lost key, their hands touch. Both of them solitary, both poetic, they are instantly attracted, and gratefully declare their love before leaving to join Rodolfo’s friends. A festive crowd celebrates Christmas Eve in the Latin Quarter. At the Café Momus, Rodolfo introduces Mimì to his roommates. Their carefree mood changes when Musetta, Marcello’s former lover, appears with Alcindoro, her aging sugar-daddy. Musetta, still in love with Marcello, attempts to attract his attention. He deliberately ignores her but eventually cannot resist her obvious play for him. Musetta shrewdly gets rid of the besotted Alcindoro and leaves him to foot the entire bill as she and her bohemian friends escape through the crowd. Early one snowy February morning, Mimì seeks out Marcello, who is painting a mural at a tavern near the city gates where Musetta now makes an honest living entertaining the travellers. Mimì tells Marcello she and Rodolfo have separated because of his jealousy. As Marcello tries to comfort her, Rodolfo appears, also seeking Marcello’s advice. Mimì conceals herself and overhears their conversation. Rodolfo tells Marcello he is leaving Mimì because of her flirtations with other men. Marcello is skeptical and forces Rodolfo to admit the truth – Mimì is mortally ill and Rodolfo is consumed by feelings of guilt and remorse, knowing that the harsh conditions of their life together have endangered her health. Mimì’s cough gives her away, and Rodolfo realizes she has overheard everything. Overwhelmed by her plight, Rodolfo promises to stay with Mimì until the spring, but Marcello and Musetta argue viciously and separate. Rodolfo and Marcello, both now separated from Mimì and Musetta, are working in their garret. Schaunard and Colline arrive with supper, and the four fantasize about attending a fancy ball. Suddenly, Musetta enters with Mimì, now close to death and desperate to be with Rodolfo. Marcello and Musetta leave to summon a doctor and to buy Mimì a muff to warm her hands. Colline also departs to sell his beloved overcoat. Left alone for a few moments, Mimì and Rodolfo remember their happier times together. The others return, but before the doctor can arrive, Mimì dies. 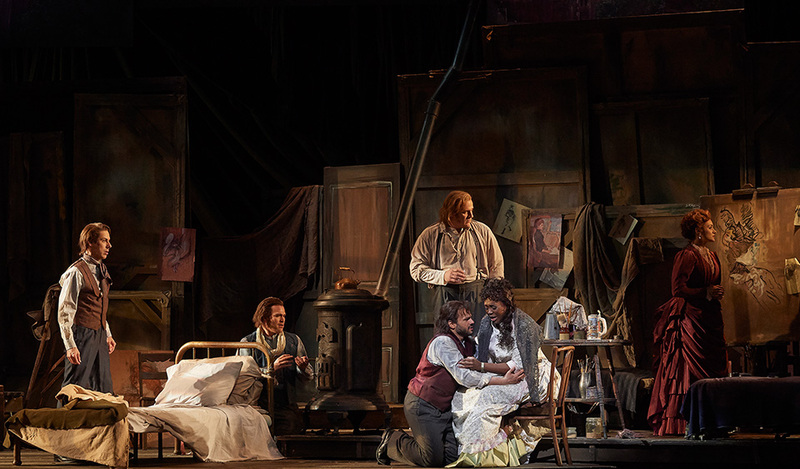 Miriam Khalil as Mimì and Joshua Guerrero as Rodolfo, all a scene from the Canadian Opera Company's production of La Bohème, 2019. All photos by Michael Cooper. Having just met Mimì, Rodolfo is already falling in love and in this aria he tells her about himself and his poetic nature. Mimì responds in this aria, in which she tells him of her life in her small room, working as a sewer of silk flowers but how her greatest joy is the coming of spring, and the blossoming of real flowers. This spring, the COC welcomes two fantastic casts for our production of Puccini’s La Bohème. Angel Blue and Miriam Khalil, our two Mimìs, had a chance to e-interview each other just before rehearsals kicked off to talk about their approaches to the role, their opera journeys, and what’s kept them going in this wonderful (but challenging!) art form. 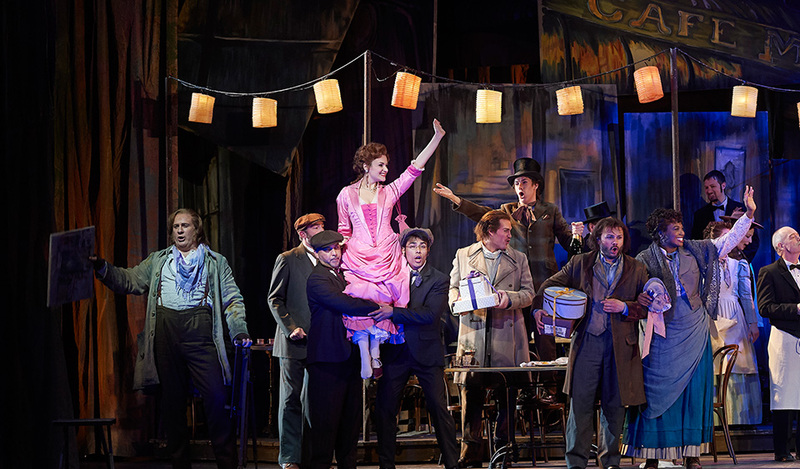 As an opera, La Bohème is both light-hearted and heartbreaking, and has drawn audiences since its premiere with its emotional score and story-telling. Here’s everything you need to know! Henri Murger was 23 years old when he started writing Scènes de la viede bohème and Théodore Barrière was 25 when he adapted the work for the stage. Both men knew very well the world they were describing, so there is a raw authenticity about their efforts that requires an interpreter to take these young characters and their plight very seriously. Puccini's masterpiece, La Bohème, features some of the most beautiful music ever written. It's no wonder it's become one of the world's most popular operas! Join us for a trip through some of the opera's most memorable musical highlights. Union and the Canadian Opera Company serve up a commuter-friendly performance of the beautiful – and beloved – La Bohème, featuring fun narration to fill in the blanks. Stay for the 45 min version of the opera or drop in to hear a few of its greatest hits. Trust us: you’ll want to take the later train. Art is life for this group of young bohemians as they navigate infatuation, poverty, love and loss; Puccini’s La Bohème has a story as timeless as the music is enchanting. In this 60-minute lecture with musicologist Margaret Cormier, you’ll get an insider look at the music and learn about what makes La Bohème one of the world’s most loved operas. Presented in partnership with the Woodbridge Library. We dropped by rehearsals for LA BOHÈME to listen to soprano Angel Blue perform Mimì's Act I aria, "Sì, mi chiamano Mimì". Piano accompaniment by Ben Malensek. 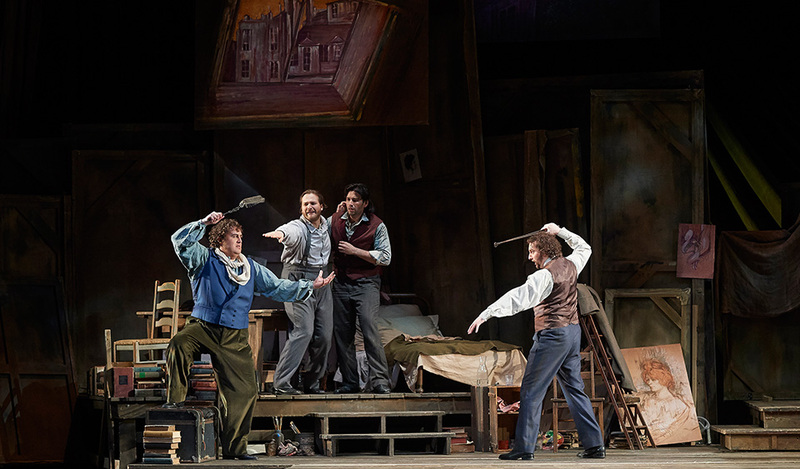 Revival director Katherine M. Carter discusses John Caird's hit production of Puccini's LA BOHÈME. Banner photo features Victor Widjaja (Senior Development Officer, Friends of the COC) and Madelyn Wilkinson (former School Programs Manager), by Gaetz Photography.